At the end of October, Alexis of Wave the Stick tagged me in an old fashioned meme created by Elan Morgan of Schmutzie fame. I am supposed to write 5 random things about me. I have been pondering what I could tell you that might be even remotely interesting and I am still not sure. I have lots of things that are random, but interesting? The pitch bend lever on my digital piano drives me absolutely crazy. I love music and I love to sing. I even have a Bachelor’s degree in Music from Dalhousie University. I do not have perfect pitch, but when the piano pitch bend lever plays it is like someone is running their fingernails over a chalkboard. It actually makes me physically sick. I love tea. I am starting to think that I may have a bit of a loose tea problem. I am not sure how many different types of loose tea I have in my tea drawer. I was able to get a Davids Tea advent calendar this year and I can’t wait to try as many of the teas as I can, even the ones that are not black teas. I am truly an ocean girl. I can’t even imagine living in a place with no ocean nearby. Even at that I am actually an Atlantic Ocean girl. While parts of the Pacific are beautiful, they don’t even compare to the majesty of the Atlantic. I think the desert is absolutely beautiful, but when I am in the desert I crave the ocean air. I am finally to the point where I actually miss winter a little bit. I like having a little bit of snow, and I even want snow to stay for a few days. Let me be honest, I hate to drive in the snow, but I love walking in the falling snow. I love the quiet that comes around the falling snow. I miss the fog horns and bells you hear in Halifax when it snows, but when it snows in Vancouver, it feels pretty close. If I can’t sleep, I almost always put on one of Neil Gaiman’s audio-books. I find his voice incredibly soothing, and I hope he wouldn’t find it a bad thing that he reads me to sleep a lot of nights. My favourite of his audio-books is Neverwhere. I must have listened to this book at least 20 times. If you have not read or listened to Neverwhere do so, now! Now to tag some people myself. I am kicking myself for taking so long but I would love to hear from Andrea at Mama in the City, Harriet of See Theo Run, Lisa of Spokesmama, Erin of Queen of Spain, and Angella of Dutch Blitz. Shouldn’t math textbooks be about teaching one how to use something before making a question so obscure that it takes a child and their parents about 2 hours to actually figure out what the hell the numbers are doing in each place? This is a family that is good at math. In fact at least one of the family members is a teacher and one of the others has a Phd in a field that required Phd level mathematics. Maybe if the book is trying to teach about Venn diagrams there should be practical questions that actually teach what Venn diagrams are for. I understand that children need to learn how to think critically. I understand that not all things need to come easily. My point is that questions should not be so obscure in their meaning that you frustrate an entire family. In our house we talk about a lot of things and not all of them are comfortable and I often wonder if I am doing a good job. We talk about war and violence against women. We talk about how to treat people, and how to be someone your friends can talk to and know they are supported. We talk about how people, Canadian soldiers, made sacrifices so we can live the life we live. 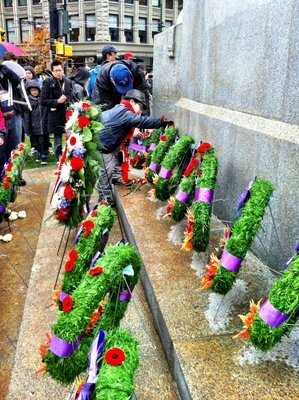 Since we didn’t make it to the ceremony today, Anthony took the boys to the cenotaph in Memorial park. A chance for the boys to pay their respects without the hoards of people. I think it resonates with them. A remembrance day toast by Aidan Floyd, age 9.